"We know your kind. You stalk and kill innocent human beings for your own amusement. Not on our watch. This is our turf. You're not welcome." Defenders: stalwart, determined, the last line against the monstrous hordes. What drives a person to make herself a veritable shield in the war against the abominations? Passion? Pride? Penance? There's no time to ask. They're the ones saving your skin. 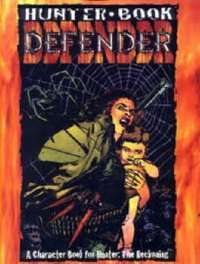 Hunter Book: Defender is the second in a new Hunter: The Reckoning series dedicated to the creeds, the character types of the imbued. Learn Defenders' philosophies, motives and ultimate goals in the war against the supernatural. Defenders are ever vigilant, but they know when to fight, and all these new weapons and wards help keep the supernatural at bay. Helpful, if you must fill the breech.